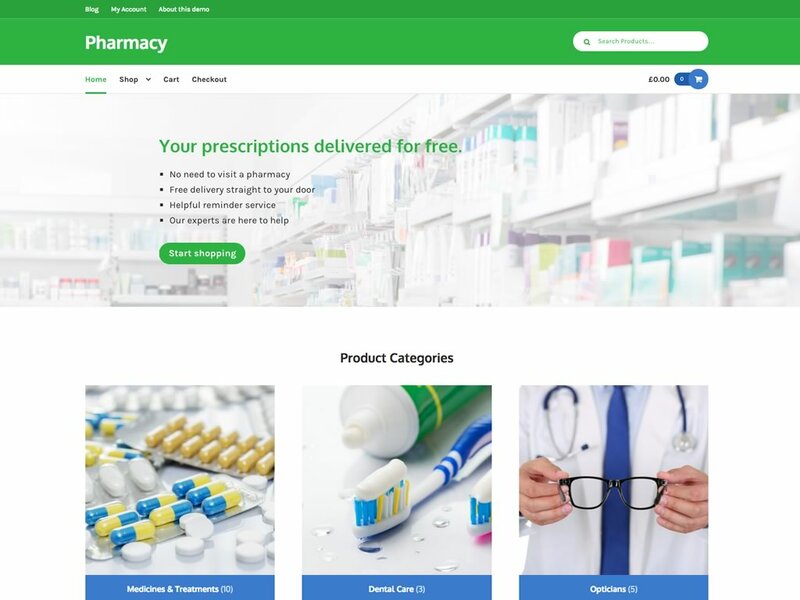 WooCommerce Pharmacy Theme: As a Storefront child theme, Pharmacy benefits from all of the tasty WooCommerce integration features that Storefront provides, Give your health store a professional, trust-worthy design with the Pharmacy Storefront Child Theme. Built upon our rock solid Storefront Parent theme you’ll also enjoy reliable integration with current and future WooCommerce releases. Give your online pharmacy a trustworthy and professional design with Pharmacy! Pharmacy is a Storefront Child Theme that has been designed specifically for the healthcare industry. It features a clean and simple design created to inspire confidence and a feeling of calm in the customer. Pharmacy is built on the robust Storefront core parent theme that you know and love. This means you’ll always enjoy 100% compatibility with the latest version of WooCommerce. Customize its look and feel as you please, or install some of the various Storefront Extensions to create a design that works for you.